We offer additional sleeping for up to two on top-quality rollaway beds that we set up in the main living area before your arrival. Add $15/night each bed. Delightful one-of-a-kind apartment! 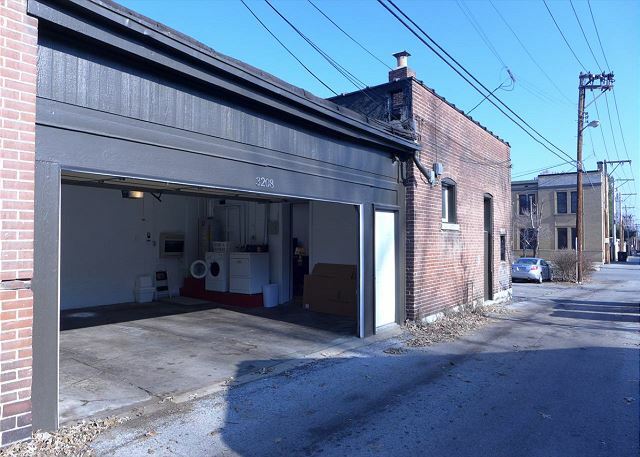 The Loft has a full kitchen, central air conditioning, oversized two-car garage, alarm system, washer and dryer, lots of storage space and much more. The Loft is full of light, featuring two monitors (or skylights). The large monitor is over the living room, and the smaller monitor is over the King-sized bed. 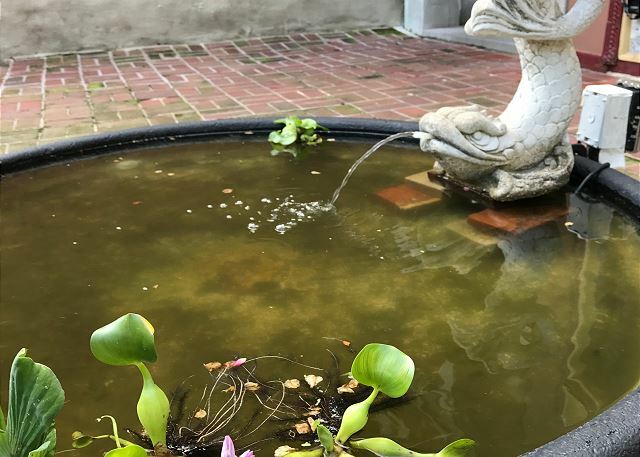 In warmer weather, sit outside and enjoy the fountain and garden in the Loft's gated courtyard. From this location it is easy to walk, bike or take public transit to the best of St. Louis. 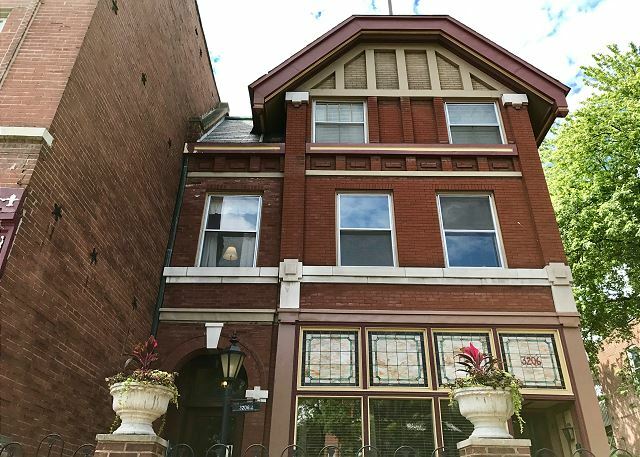 The Loft is in the city's grand Tower Grove East neighborhood, near Compton heights, offering easy access to Interstate 44 via either Grand or Jefferson boulevards. The Gateway Arch and Downtown St. Louis are about three miles from the Loft. 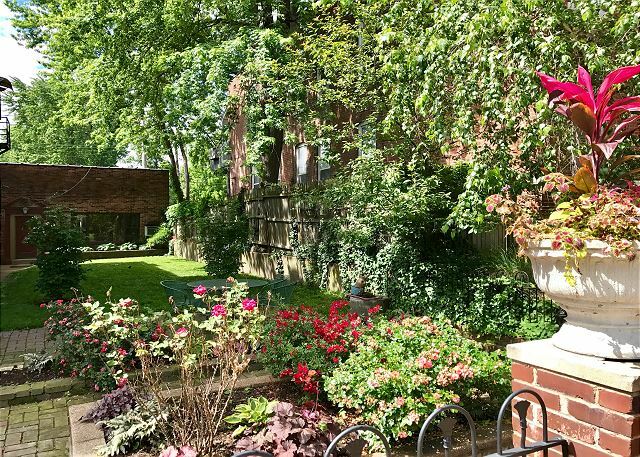 The world-renowned Missouri Botanical Garden is a delightful walk west of the Loft through some of the city's finest historic neighborhoods. St. Louis University Medical Center is within walking distance. The main campus of St. Louis University is two miles north. Washington University's main campus is about seven miles from the Loft. Barnes Hospital & Washington University Medical Center is four miles from the apartment. Numerous restaurants and magnificent historic parks are within walking distance. Sleeps up to four. 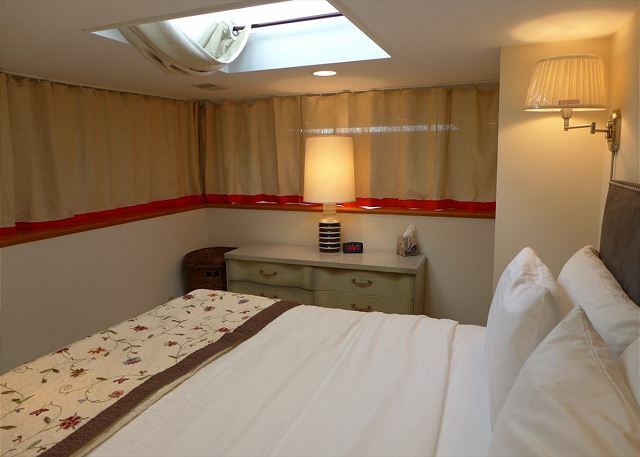 The Loft has an excellent-quality King-sized bed in a second-floor sleeping area with curtains for privacy. Add $15 per night per person for third and fourth persons. The beds for third and four persons are highest-quality rollaways that are set up in the main living area. Please note! The Loft is an open space, so third and fourth persons in residence will not have privacy. Our pricing defaults to two guests sharing the king bed. If you will have two in your party, but would like to use one rollaway bed, please make your reservation for three. If you will have three in your party, but would like to use two rollaway beds, please make your reservation for four. The Loft includes an adjacent two-car garage for parking. Two-night minimum required on weekends. We use dynamic pricing to ensure competitive rates. Sorry, while we all love them, we do not allow pets at the Loft. The Loft is on the ground floor, but has steps leading to the front entrance, the lofted sleeping area, the living room area, and to the garage. We recently spent a long weekend at the loft at Shenandoah. We enjoyed the location (residential) but with a pub (Crafted - check it out!! So good!) and a coffee shop across the street (also amazing good food and coffee - and local!). The loft provided enough space to relax but not feel like we were right next to each other. Skylights are a great touch (I believe they are part of the old bakery structure) and I enjoyed the attached garage since it was rainy and muddy most of the long weekend we were there. This place made our vacation perfect! The garage was super convenient and made it a breeze to come and go as we pleased without having to worry about parking. Everything was very clean and we would highly recommend it to anyone looking to stay in St. Louis. My family and I have stayed several times and we thoroughly enjoyed it. I highly recommend it to anyone. EXCELLENT! We will be back to stay again!!!! It was great to have a garage in the city. Each time my family and I reserve a rental we receive top-knotch service. Everything is clean and comfortable; so much so that you feel as if you're in your vacation home! Rachel and Karen always make the experience special. SFShannon's price point for each rental is truly a great value for ammenities included. Proximity to major attractions is also awesome! Great job SFShannon! I loved this place!It was very spacious and loved the natural light. It's right next to Crafted which has delicious food and drink and 5 minutes away from grocery store. It is such a acute space with it's own garage. I will be staying here again. It is a hidden gem in South Saint Louis! Two Great Nights at the Shenandoah Loft! We have used SF Shannon several times, for our overnight/getaway accommodations in the city of St. Louis. So far, we have stayed at the Shaw Guest Suite twice, and now, the Shenandoah Loft. Both apartments are very unique, comfortable and cozy. We very much appreciated the Shenandoah Loft because of its spaciousness, history of the building, as well as, the offstreet parking in the attached parking garage. The Loft was spotlessly clean, the king size bed, very comfy; it was quiet and private. We enjoyed dinner at Pho Long Vietnamese restaurant on South Grand, coffee at Starbucks (So. Grand), lunch at Hartford Coffee and Flora Borealis at the MO Botanical Gardens. 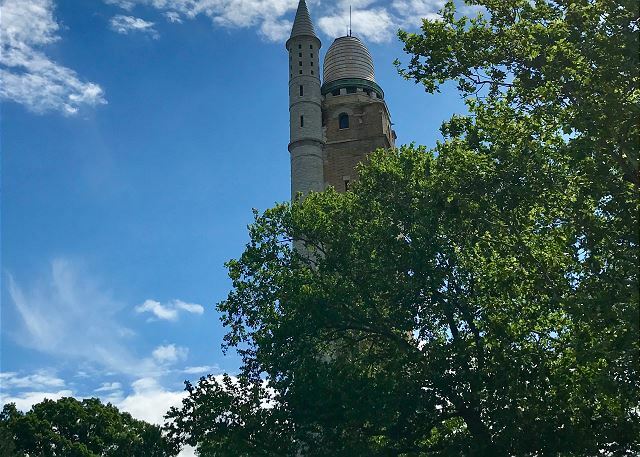 There are so many wonderful things to see and do in this part of the city! We will definitely return, and certainly would recommend SF Shannon to anyone who is looking for a home away from home while staying in the city of St. Louis. Thank you! Loved the small touches that made it feel like being home. There were some breakfast food, coffee, a couple snacks and even a couple adult beverages. Even had some toiletries just in case you forget something. Neighborhood had an amazing feeling. Quick walk to a coffee shop or even a spot for a drink all while being less than an easy 10 minute drive downtown. Having a private garage with direct access into flat made it that much more comfortable. So easy to communicate with owners who would respond to any questions almost immediately. When we visit again, we won’t stay anywhere else! The snacks and drinks were great! Comfortable bed, and very secure! Will stay again! I stayed at the loft for 6 days. I was in St. Louis for meetings. The loft was extremely clean and well maintained. 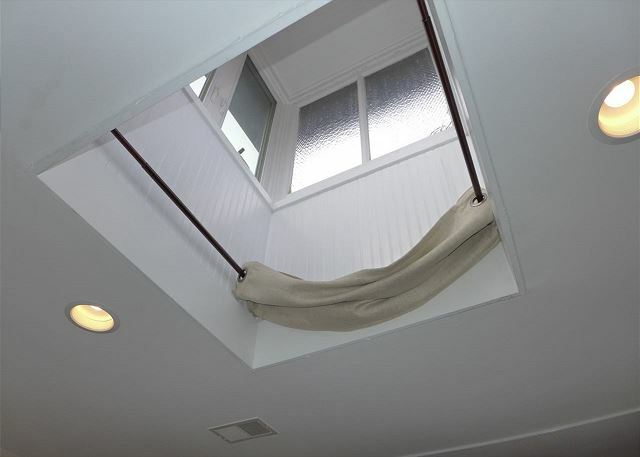 Though we did not meet the owners, access to the loft was clearly explained and quite easy. Amenities for a couple of breakfasts and snacks were provided, which was appreciated, as was the security garage attached to the loft for my car. The loft was quiet and spacious and I will definitely stay there again when I am in St. Louis. Always GREAT with SF Shannon! We have stayed several times with SF Shannon and always have a fantastic experience. Their properties are always very clean and well maintained. Each space is decorated super cute and stocked with pretty much anything you could need during your stay. They greet you with things like fresh coffee beans, eggs, treats, local beer, etc. The communication and check-in/out process is always easy. Plus you have access to several people any time in case you may need something. They are just very consistent in good hospitality. We stayed in the Loft at Shenandoah this time and it was very spacious and comfortable. We had a 3rd adult with us and had plenty of space. The use of the garage was a bonus, although we've never had issues with street parking here. The neighborhood is quiet, near LOTS of fantastic restaurants and an easy 10 minutes to downtown or other great neighborhoods within the city. If you stay on Shenandoah, try the Tower Grove Farmers Market, Shaved Duck and Rooster. We travel to STL a few times a year and never hesitate to stay with SF Shannon. Enjoy! It was just like being at home. After a long drive, we arrived at this fantastic trendy place. The beds were so comfortable, and I was the one who stayed on the rollaway! In the morning, we didn't have to go anywhere for breakfast as the management thought of everything one needed to a great little breakfast. Eggs, bagels, coffee beans, fresh fruit! Even chocolate. We did up our laundry in the garage where our car was safe and snug for the evening. Thank you for a wonderful stay. The Loft was exactly what we were looking for. 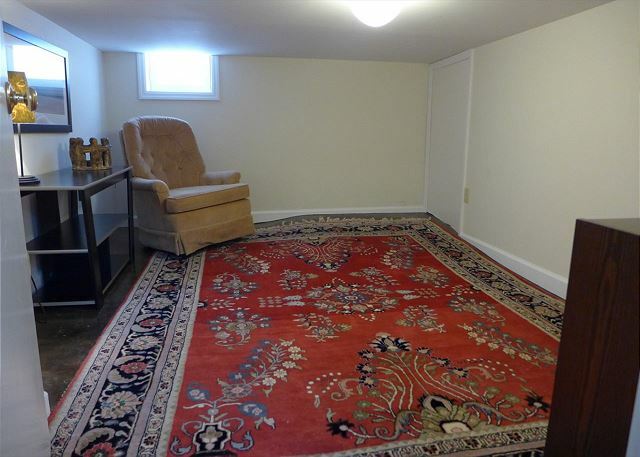 Great location, quiet, perfectly furnished. We utilized Lyft to get around town, and the location was pretty much central - whether going downtown, to the Hill, the Art Museum. We were mostly out enjoying St. Louis. Highly recommend the Art Museum, the Arch (of course), touring Anheuser Busch, and listening to blues in the the establishments by Busch Stadium! Will stay again for sure if back in St. Louis!! We have stayed in SF Shannon units before and always enjoy them. The staff is great, always making the check in process easy. We were slightly concerned about a short fight that occurred across the street When we arrived but we had no trouble. There is nice little place for a drink on the corner. Great place to stay with lots of amenities. A/C went out during our stay, but the management got right on it and it was back working in short order. Communication with the property management was top notch both before and during our stay! We spent a great two days in St. Louis at the Loft. It was well kept, clean and comfortable. If we return to the St. Louis area we will definitely be contacting SFShannon for accommodations. As always, Karen and Shannon are the most accommodating hosts. There properties are alway clean and well stocked. Plus towels, comfortable beds and I warm inviting atmosphere. Lovely loft in a great area of St. Louis. High ceilings and natural lighting augment this roomy, well styled space. A two car attached garage and a beautiful courtyard were very much appreciated. A beautiful example of bringing St. Louis elegant architecture into the future while highlighting its past. I would highly recommend. This has been the perfect place for my wife and I to stay, while our son was in medical school. Conveniently located, safe neighborhood, personal space, garage parking, laundry facilities, clean, spacious, all the comforts of home and accommodating staff. We will miss staying in this fantastic space but if we ever return to StL, and require lodging, we will definitely book this property. Thank you Rachel, Karen, Anne and the entire SF Shannon team for helping to make these past 4 years extra special! Thank you, Bob! You and your family have been PERFECT guests. We are so grateful! We loved staying at the Loft. It was a great location and the space had everything we needed. We loved that there was a garage and the house was stocked with some snacks. If you stay here you have to eat at the Shaved Duck which is just around the corner. We were very pleased with our stay! The Loft at Shenandoah was great. It was clean, modern, and was a great location. We would definitely recommend it to anyone wanting to visit St. Louis. The loft is a great space for two; more than two might feel a little crowded. 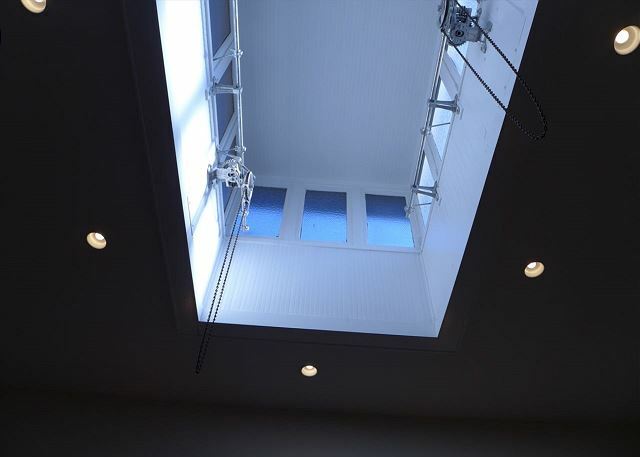 Love the natural light from the skylights. The garage is a big plus! Location is great; not too far from anything. Property management company was easy to work with and helpful when we had questions. My wife and I have stayed many times and it is always a no hassle pleasant experience. ANOTHER GREAT ST. LOUIS EXPERIENCE! We go to St. Louis for a 2-week visit 3 times a year to see our kids and grandkids. For the last 5-6 years we have been staying in SF Shannon properties. The Loft at Shenandoah is always our first choice. tropical island like Sandals. The Loft is just a great home away from home. Perfect spot for us. Dog friendly. Close to everything we want to do when in St Louis. Would certainly book again. The Loft at Shenandoah is a wonderful place to stay. The apartment is very spacious with lots of nooks, and the bed and living room furniture was very comfortable. 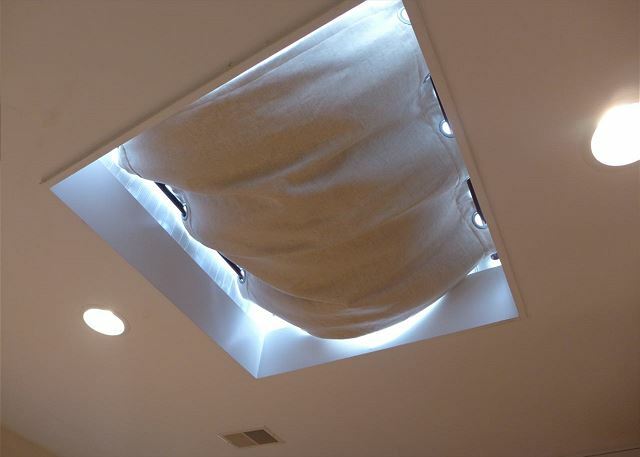 With all the skylights, you'll never even miss the windows. Having access to the private garage was really convenience and made us feel very safe. The neighborhood is great (we highly recommend happy hour next door at Crafted) and this apartment really makes you feel like a St. Louis native. The management company is very communicative - they're transitioning to a smartphone app which is great, but we found the instructions differed a little from those that were emailed and in the loft, but they were very responsive with questions. We were overwhelmed by all the treats they left us! We highly recommend this for any couple or small family. A unique place to stay! we come) and would not hesitate to book with them again! As usual, the extremely comfortable and ideally located loft apartment met all of our needs. We'll be back next year. The loft is one of the coolest places I've ever stayed in, and SF Shannon was totally awesome to rent from. I would absolutely suggest renting this property (and from them) to ANYONE. They were so accomidating to our pup (had the furniture covered) and their new app for your smartphone is terrific. You will not go wrong renting the loft or with SF Shannon! Good selection to stay in St. Louis. Loft was well stocked with necessities and little extras that made the stay enjoyable. The location was convenient to The Hill and many restaurants. The Crafted was next door and their "steak night" was excellent. The Loft was roomy and comfortable. representative apologized profusely and offered for us to drop off our bags, if needed. When we arrived, after it became available, their was an apology note with 2 beautiful custom coffee mugs waiting for us. SF Shannon clearly understands customer service and they value their repeat guests. We will always stay in their properties when visiting our son in StL. The Loft is in a great location. We were in town for a WashU college visit and the location was great for us. We were close to everything we wanted to do- The zoo, museums, WashU, The Loop. The place was extremely clean. Thank you for the eggs, bagels, etc. Well stocked with everything you need. Our dog loved it as well. She stresses when we travel, but she immediately got in her dog bed and was settled after a few minutes. Loved that there is a garage for your vehicle and to unload. Area felt safe and great place to walk. Contacted owners twice and both times, they responded immediately. If our son attends WashU, the Loft would be the first place we would rent for a visit. This is our second stay at the Loft, and it was just as great as the first time. It is clean, has a garage, great places to eat, beautiful decor, management very helpful and prompt. Plan to stay here again in July. It is the best and I would heartily recommend it! Had an extended stay a the loft for my sons final week in college and his graduation from Washu (about a 15 drive no traffic) Great neighborhood location. close to some fabulous restaurants and Tower Park. 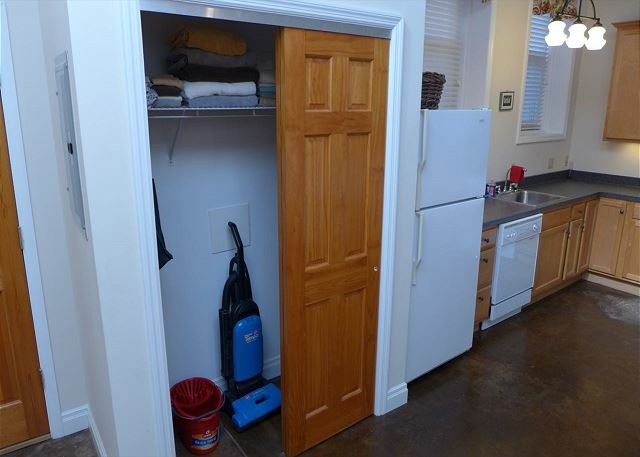 the unit itself is spacious and works great for a couple. Our twenty something daughter joined us and they had a rollaway bed put in and that was perfect. For us way better than a hotel. Wish we had found it earlier in my sons college experiance cause we would use it all the time. If you like having your own space, that provides the comforts of home, then SF Shannon properties are for you. We have been returning guests for the past 3 years, whenever we visit our son in StL. The staff and accommodations are second to none and the check-in/check-out procedures are extremely convenient. 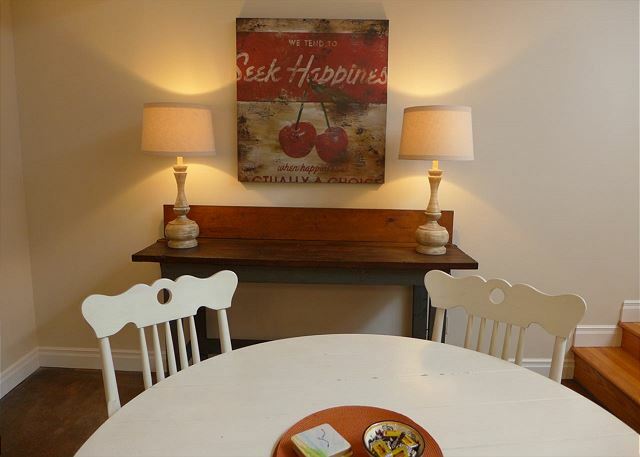 Great, safe location within walking distance of many great things to do. ANOTHER GREAT VISIT TO THE LOFT! We have enjoyed staying at the Loft on Shenandoah several times each year. It is always clean, comfortable and ready for our arrival. WOW, was this a wonderful place to stay. From the minute we walked in, we just fell in love with the apartment. Nice and spacious, comfortable furniture, comfortable beds, attractive decor, plus everything and more that you would need in the spacious kitchen. There were even treats everywhere including fresh pumpkin bread AND BUTTER. Something we really enjoyed was the attached garage which made unloading and loading the car so much easier. It will be great in bad weather. The place was spotless and the SF Shannon Co. could not have been nicer to work with. The bedroom is up a short flight of stairs if that is a problem, but they put a great cot up for me in the roomy living room and I slept like a log. And wait until you see the luxurious towels! I've never bought that quality of towel for myself! Plus there were plenty of them. There were bagels and fruit for our breakfast. The TV and the wifi were great. The pictures don't de this place justice: it is much better. We spent most of our time at the Botanical Gardens which were really handy to the Loft and beautifully decked out for Christmas. You can't go wrong with The Loft and we would highly recommend it. We're planning on coming back in January, February and March. This place is a real treasure. This is a unique place, great for an extended stay, in an interesting neighborhood. Tucked away in a courtyard, very private. Inside the main floor has a really nice loft feel, with a mini-loft up a short flight of stairs, a bed positioned under an old skylight. 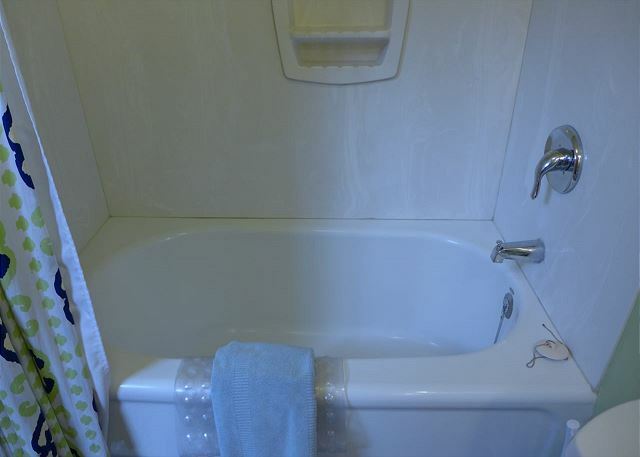 Very clean, great towels, wonderful huge tub. Kitchen is well-equipped. Would recommend it highly. Everything is as described by owners. Managers are excellent about making arrival and departure a breeze. Great place to stay. Once again, an excellent stay! This was our second visit to the loft. We found it very comfortable with all of the amenities of home. It was exactly as pictured. There were coffee and breakfast items left for us in the loft, but if you prefer there is a coffee shop across the street. My husband and I thoroughly enjoyed our stay at the loft. It was comfortable, well appointed and a great base from which to explore the city. The poodles liked it too and it was lovely to be welcomed with our furry travel companions. 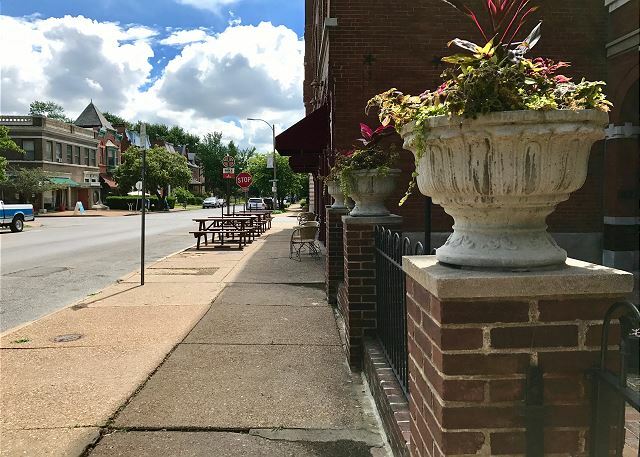 We would definitely recommend it to anyone looking for a quiet and cozy place in a great part of St. Louis. Open beautiful space with so many personal touches. We felt very taken care of and pampered. Crafted next door was a good stop to eat and relax. Everything in the Loft was clean, well maintained, architecturally beautiful and well laid out. Thank you for all of your little touches. The apartment is in a quiet neighborhood and was perfect for a weekend stay in St. Louis. It was great for my husband and me and there was plenty of space for the cot that was provided for our daughter for one of the nights. The location is perfect! Lots of natural light, comfy bed and everything you need is stocked in the kitchen. The tub is fantastic and deep if you love a good soak. The amenities were above and beyond. Great place to stay and we loved the private parking. 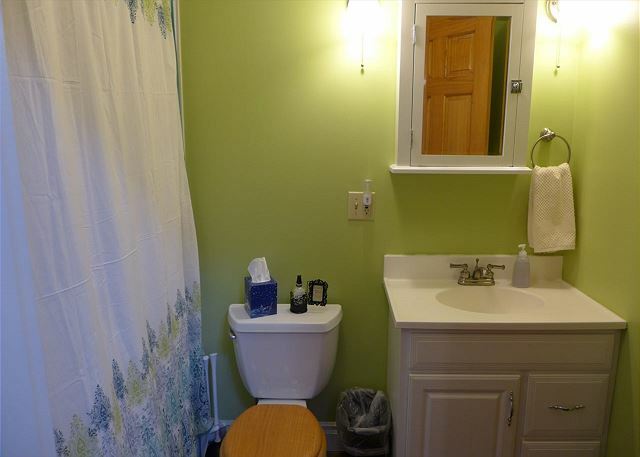 Great location, very clean, great owners. Would rent again! Ladies thank you so much for a fabulous stay in the loft. Your hospitality and the comfort of the loft have been unmatched in any of my many travels. Close to everything yet quiet getaway when we were ready to just relax. Can't wait to visit again and we will definitely be recommending you to others. We had a wonderful time in St. LOUIS. Having the loft to relax in during our down time, made it even better. Everything was so clean and neat. Great to have fresh fruit and bagels as well as beverages available upon arrival. This is the second year that we have stayed in the beautifully accommodated loft apartment. The experience was excellent. Rachel and Karen's attention to small details makes staying in their properties first class. This was perfect for our weekend getaway with our fur baby. Whenever we are able to visit our son, we check the availability of all SF Shannon properties. Their properties are always clean and well maintained and both Karen & Rachel are fantastic to deal with and always accommodating. Recently, we visited our son over Memorial Day weekend and the Loft at Shenandoah served as the perfect place to stay. The full kitchen and spacious setting served as the ideal place to serve dinner to our son and some of his medical school classmates. We will be visiting again this fall, and we have already booked our stay at the Loft. This is the second time that my wife and I have stayed in a SF Shannon property and it definitely will not be the last. The space is a quirky historic space that is extremely comfortable, spacious, private and has everything needed for a vacation stay. Rachel is fabulous to work with and was flexible in meeting our earlier than expected arrival. Both properties we have stayed at have been extremely clean and well stocked with all the comforts of home as well as food items. When coming to StL, for future visits, we will continue to check the availability of this and other SF Shannon properties. Thanks for another great stay! While spending a relaxing weekend in St Louis, the loft was the perfect place for our small family!! 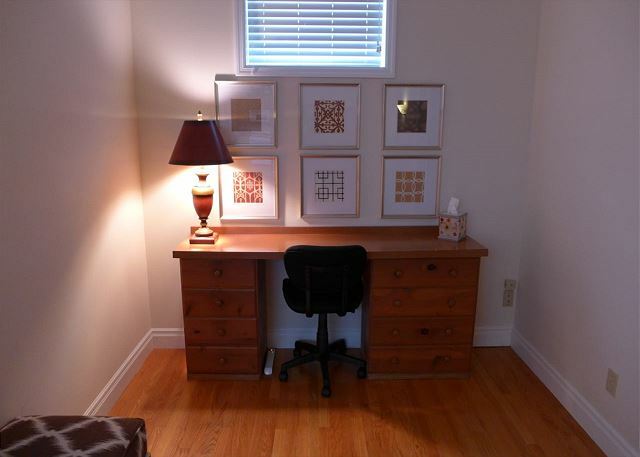 My husband and I found it clean, organized, modern, yet delightfully charming, and oh! so relaxing! The children were sad to leave! Karen and Rachel were wonderful to work with! A total recommendation! My family loves staying here. Mark B from Springdale, AR does not recommend this vacation rental. This is a great place to stay when visiting St. Louis. We love it. Easy to get anywhere in the area with a short drive or walk. We had a great time and everything at the loft was very nice and clean. Rachael and Karen made our stay very comfortable and they were helpful with letting us know what was in the neighborhood. We loved that we could walk to go out for New Year's Eve with our friends. My husband and I stayed here for a weekend and absolutely loved it. Such a cute and charming loft and neighborhood. When we met with the owner/host for check in she was very nice and helpful. We felt very safe and comfortable here. We brought our dog and that went well. Great area for dog walking and the parks nearby. The added bonus of gourmet coffee, drinks and snacks were unexpected and highly appreciated. That was a nice bonus to our stay. We recommend staying here and would stay here again in the future. 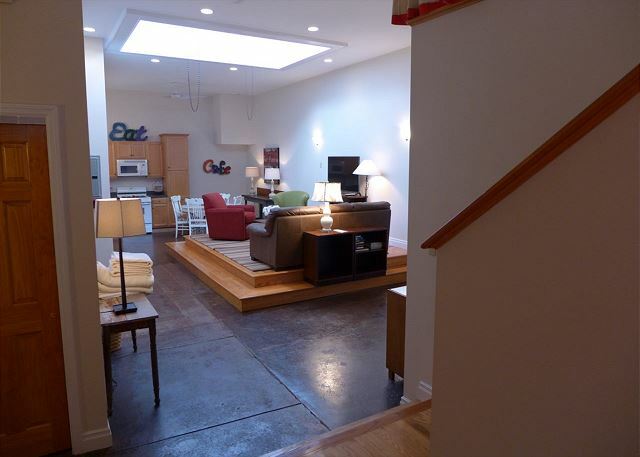 This loft was fabulous, with all of the amenities of home! It was exactly as pictured on line. The breakfast foods, snacks and bathroom toiletries were a bonus! We will definitely stay here again! The Loft apartment in St. Louis was a perfect place to stay! The Loft was very clean and beautifully decorated. We felt right at home. Fun neighborhood for walking. The Loft at Shenandoah sets a new standard of excellence for all other VRBO rentals. I felt like I was a guest in someone's home. Between the fresh coffee beans, refrigerator stocked with fruit, breakfast foods, drinks and condiments, to the plush towels and well stocked kitchen, this rental had everything a person could ask for. And it was pet friendly! The location was perfect and the neighborhood and local parks were great to visit and were dog friendly. 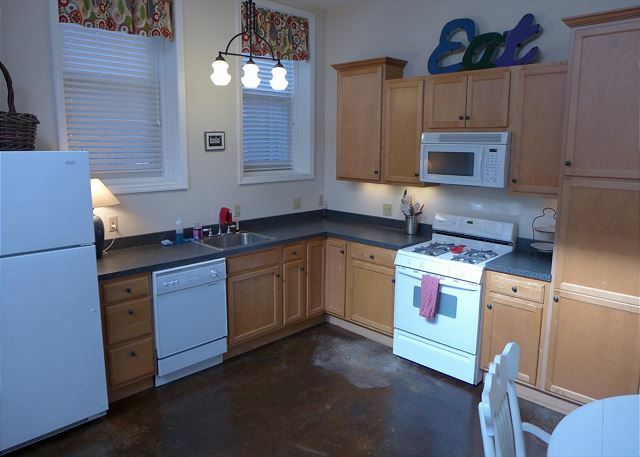 Easy access to the interstate to Purina Farms or to St. Louis. Owners were super helpful and responsive to my questions before and during my stay. If traveling to St. Louis again, this would be my first (and only) choice of a place to stay. What a charmer!! We loved this cute, very spacious, nicely decorated, very clean apartment! 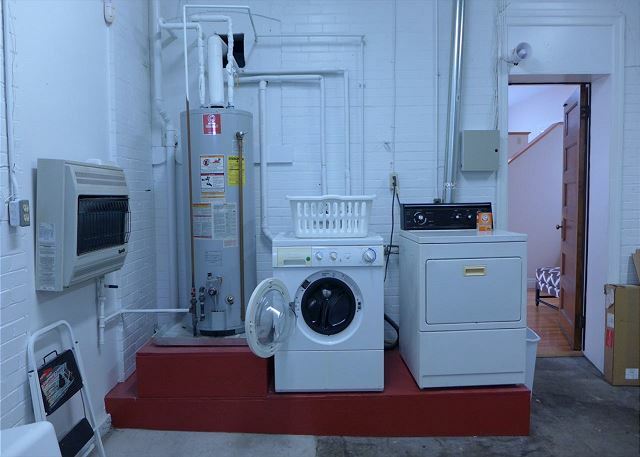 Great location, nice to have a garage, washer & dryer, and all the amenities of home. Rachel & Karen do an outstanding job with their apartments for their guests. Fresh fruit, snacks, coffee and sweet chocolates are waiting for your enjoyment! Thank you Rachel, Donna & Karen for a wonderful stay!! You are the BEST!!! This is a great place to stay. It is not the most convenient location, but once you figure out the area it is workable. We spent a week there and really liked it. The Loft at Shenandoah was the perfect place to stay while visiting family in STL. For the price of a hotel suite, we had a private space with a two-car garage and a full kitchen, which was also fully stocked with breakfast fare (fruit, English muffins, eggs), coffee, sodas, and snacks when we arrived. There are plenty of restaurants within walking distance, so it was nice to have a full fridge and microwave for leftovers as well. The little room under the bedroom turned out to be a great place for my toddler to play with her toys and books. This rental was a lovely and peaceful space in the midst of our busy trip back home. Another great addition to Karen & Rachel's wonderful properties, we really enjoyed the space and as always they have thought of everything! Thanks for sharing. We were pleasantly surprised by the Loft at Shenandoah. 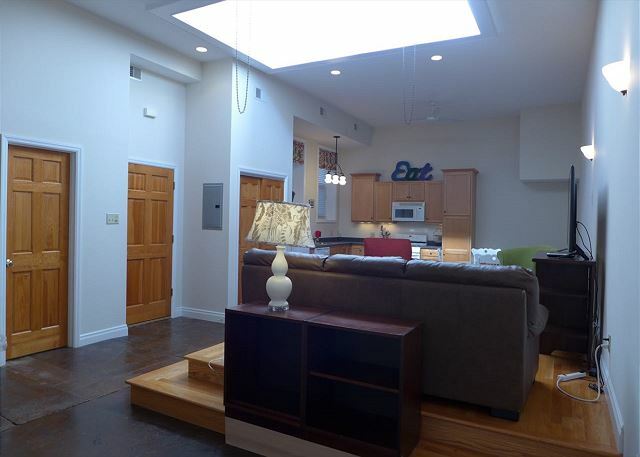 The loft was beautiful, very clean, tastefully decorated and had plenty of natural light. Karen, who took care of our accommodation was very thoughtful, efficient and pleasant. We jumped for joy, after an early morning flight, when we saw that the ref had drinks, bagels and fruits. We love to grind our coffee beans just before brewing and to our delight the Loft had this. Chocolate squares were thoughtfully placed on the table. Although we didn't use the kitchen utensils and glasswares much, we noticed that all were in great condition. 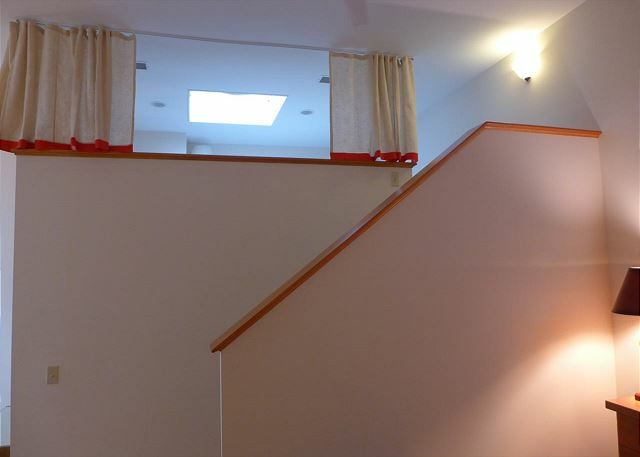 Everything in the Loft were provided with the comfort and satisfaction of its guests in mind. The littlest minus was the garage because it was not easy to maneuver due to an unused RV parked near the door. But let this not take you away from this fabulous property. We will not hesitate to recommend it to our friends. Thanks SF Shannon for a wonderful and great stay. We had a wonderful time recently staying at the Loft at Shenandoah in St. Louis. The space is centrally located. The décor was contemporary and cool. The loft apartment was extremely quiet and the front door opened up into a small grass and brick courtyard. The loft included all of the amenities one would expect if one was at their own home. Visiting St. Louis? Stay at The Loft! Thoroughly enjoyed our recent stay at The Loft. The reservation process was smooth and well managed. The apartment was nicely decorated, comfortable, and quiet. The garage was a nice perk and very convenient. The alarm system gave us comfort. The rental management went the extra mile and had snacks ready and drinks chilling in the fridge for our arrival. 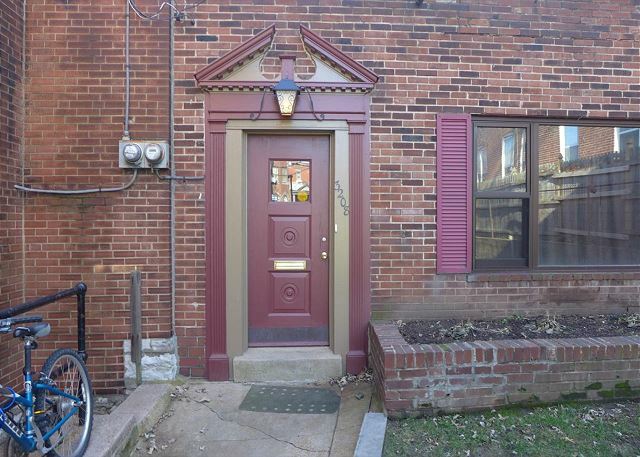 The location is convenient to downtown, Tower Grove Park, Forest Park, etc. The coffee shop, Kitchen House, across the street was a favorite hangout. The neighborhood is nice but we would classify it as transitional -- safe but some caution. No issues, but cautious. We rent here again and would highly recommend The Loft. Our stay at the loft was amazing. We stayed with our family and the kids LOVED the extra treats provided. The place was clean with an open layout. We were able to go the an cardinal's game, city museum, the arch, find great restaurants, and also attend the conference we came for. We rested easy at night as it was quiet at night. The location was right for us. Karen and Rachel were both to helpful and friendly. With the great customer service, I would stay again at any of their places. We were in town for the Botanical Garden Lantern Festival, a few concerts and a Cards game. The Loft was convenient to all that and much more. Our accommodations were attractive/stylish and the mattresses and linens super comfortable (one of our party slept on the rollout and even gave it a thumbs up). The kitchen was so well stocked, I never made the grocery store run I had planned! Really a nice stay. It was rainy the week we were there and we particularly appreciated the convenience of our adjacent garage and nearby eateries. Look forward to a return visit. janice k from Tabernacle, NJ does not recommend this vacation rental. The Loft space is fine but the company running the show isn't. Twenty-four hours after leaving the space I received an email from K. informing me that there was evidence of smoking and I would be charged $250 for cleaning. No mention of what that "evidence" was. First, we are non smokers and I told that to R when she mentioned the policy upon check in. Second, The Loft has a small shared hallway with a investigation company and we were told that people could be going in and out during our stay. Third, the email came the day after we checked out so we have no idea what happened in that space after we left. I emailed and called R. and had to leave a message telling her there was no smoking at any time in The Loft while we were there and how upset I was by the email accusation. I received a voice mail message from R. telling me that someone named D. whom I'm guessing was on the cleaning crew "THOUGHT she smelled smoke". R. apologized and said I wouldn't be charged. I am still upset about this four days later. My husband and I travel a great deal and rent places all over the world. I've never had an experience like this before. If you choose to rent from this company make sure you insist they send someone over for check out to protect yourself from this business practice. We are sorry that Janice felt falsely accused. When we went in to clean the apartment, we smelled the clear odor of cigarette smoke. When we stripped the bed linens, the sheets clearly smelled of cigarette smoke (we confirmed this smell with others who are not affiliated with our company). Even though we make it very clear that smoking is not allowed in our accommodations or anywhere on the premises, we did not charge Janice any additional fees. In fact, we believe that we sent her a very cordial letter regarding this matter. We are sorry that she was upset by it, and wish her well! The loft was a great place for us to stay on a weekend in StL with two kid, ages 6 and 8. There was plenty of room for us in the very comfortable space. The apartment was very clean and provided for all our needs. It was great having an enclosed garage with remote entry. We found lots of snacks, fruits, even a couple of beers provided for us upon arrival, all included in the rental fee. The neighborhood was beautiful and eclectic. We enjoyed the coffee shop across the street and walked through the neighborhood enjoying the view of the 100+ year old mansions on Longfellow and Hawthorne streets. The area was convenient to downtown and the sites there. The owner greeted us upon arrival and was very friendly and gracious. She gave us some helpful tips , showed us around the loft, and made us feel very welcomed. If you are looking for a unique, urban, comfortable space in a very cool neighborhood, this is a great choice. The place was very nice. Felt like we were home in minutes of arriving. Racheal is SOOO easy to deal with. Between Karen and Racheal they made everything go very smooth. WE WILL BE RETURNING!! this a a great location. We had a great stay! Rachel is a great hostess and had many treats for us upon arrival. She had baked banana bread that day and shared with us! We really loved the loft and look forward to two more stays this year! 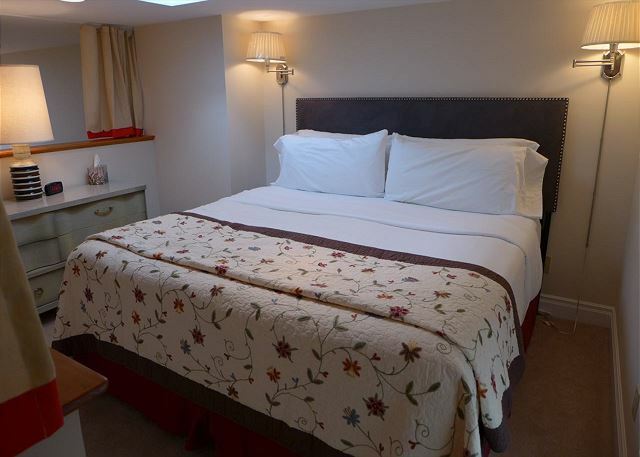 The loft is well appointed and very comfortable for visitors. We highly recommend it to anyone. It is located to many fine restaurants and a coffee house on the corner. Great property, excellent service, super experience. Attention to special details-coffee,bagels and sweets…nice to be treated well! This place was perfect. Cute little quaint place with a modern décor. Next to the loft is a massage place and martini bar with great food! I highly recommend this place. Will definitely be back. It was totally fabulous! the location is excellent, and the place is comfortable and lovely. I especially liked the "little extras" like coffee, teas, and bottled water. Our stay couldnt have been nicer!